Service organizations have to deal with highly uncertain events, both in the internal and external environment. In the academic literature and in practice there is not much knowledge about how to deal with this uncertainty. 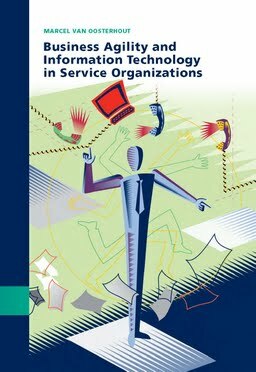 This PhD dissertation investigates the role and impact of information technologies (IT) on business agility in service organizations. Business agility is a relatively new term defined as the capability of organizations to swiftly change businesses and business processes beyond the normal level of flexibility to effectively manage highly uncertain and unexpected, but potentially consequential internal and external events. Empirical research was carried out via surveys and interviews among managers from 35 organizations in four industries and in three governmental sectors. Four in-depth case studies were carried out within one service organization. The dissertation has six key findings: 1) In many large service organizations business agility is hampered by a lack of IT agility. 2) Organization and alignment of processes and information systems via the cycle of sensing, responding and learning along with the alignment of business and IT are important conditions for improving business agility performance of service organizations. 3) Standardization of IT capabilities and higher levels of data quality support higher levels of business agility of service organizations. 4) Two knowledge management strategies – codification and personalization -- are identified that can be used to respond to events with different degrees of uncertainty. A codification knowledge management strategy supports the response to events with low levels of uncertainty by exploiting explicit knowledge from organizational memory. A personalization knowledge management strategy drives the response to events with high levels of uncertainty by exploitation of tacit knowledge and social capital. 5) Social capital is an important moderating variable in the relation between IT capabilities and business agility. Social capital can mitigate the lack of IT agility that exists in many service organizations by overcoming information system boundaries and rigidities via human relationships. 6) The combination of sensing, responding and learning capabilities is required to increase all dimensions of business agility performance. Overall, this research introduces a new approach to analyze and measure business agility. This thesis takes the first steps to develop theoretical knowledge on the conditions under which IT supports higher levels of business agility and business agility performance.